I've finally got round to finishing installing my navigation gear! I spent 9 hours on it in total, which sounds like a lot, but I've been meticulous in planning everything and making sure the whole system is as reliable as possible. I've wired everything up myself and made a loom for the power supply. I've also used copious amounts of insulation tape, cable ties, heat shrink wrap, solder and waterproof connectors - hopefully they will withstand what's thrown at them in the heat of the race. I now have an auxiliary power loom running from the battery along the frame and under the tank up to the bars. There's an inline blade fuse which is in a waterproof housing but easy to change, with an indicator LED to let me know if it's blown. There's an isolator switch to turn all the systems off, a GZ multiswitch to control the F2R RB750 electronic roadbook reader and an ICO to provide my trip readings. Everything is mounted to the Moto Rally Services roadbook plate and bar mount kit, and the bike can be completely swapped from enduro to rally spec in less than an hour. I still need to calibrate my ICO and do some very small improvements to help protect important components, but the bike is effectively ready to race now, I'm so excited for Pikes Peak! 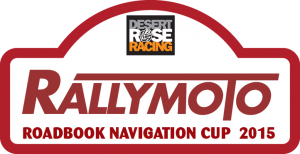 For more information on the kit I'm using, visit the Moto Rally Services website and check out the navigation bundle.